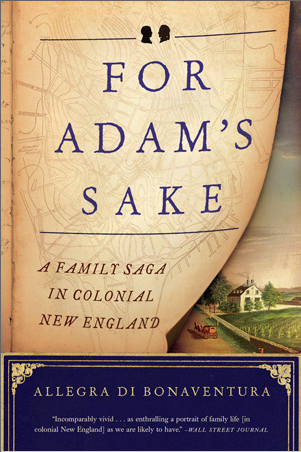 Recently I have been listening to the audio version of For Adam’s Sake: A Family Saga in Colonial New England, by colonial historian Allegra di Bonaventura. The author has based the narrative on a remarkable diary kept from 1711 until 1758 by farmer and tradesman Joshua Hempstead of New London, Connecticut. I think it’s the first book I’ve ever read that covers the slave experience in colonial New England. I find di Bonaventura’s ability to read between the lines especially intriguing, much in the way we try to teach students to ask “Whose story is not being told?” when they begin to dig into the meaning of primary sources. For Adam’s Sake relies heavily on Hempstead’s diary, of course, but throughout the book, skillful historiography is in evidence as well. The author uses court documents and town and church records to support often cryptic diary entries. I am learning not only about slaves and freedmen, but also about the larger context of colonial life, suffering, labor, family relationships, social strata, and so much more. While slowly making my way through this study, several faint but persistent memories kept sending small shock waves through my mind, only to disappear as quickly as they had entered. Names like Fox, Rogers, and Winthrop. Places like New London and East Hampton. Trades like shipwright and tanner. So last night, I finally checked the genealogy book compiled by my mother in 1976 as a gift to all the family. Sure enough. Fox, Rogers, New London, epidemics, and “tanner” are all mentioned. Suddenly I am listening to the book with the keenest possible interest. My own ancestors could have known the Hempsteads, even perhaps the slave Adam Jackson, but if not, the descriptions of colonial life would have matched their own experience. Oh, if only our students could always discover a personal connection to history! Thomas Fox, born in England in 1625, emigrated from England to America prior to March, 1644. He married (1) Rebecca ____ on October 13, 1647, and married (2) Hannah Brooks on December 13, 1647. He was elected a freeman at Concord in the Massachusetts Colony in 1644. His name was on the Concord church roll. His will, dated January 25, 1657, was signed in his own handwriting and witnessed by Edward Bulkley, son of the Reverend Peter Bulkley, founder of Concord, Connecticut. It was signed “Ffoxe” and his wife Hannah was named executrix. He died April 14, 1658. Samuel Fox, son of Thomas, was born in 1651 or 1657 and settled in New London, Connecticut in 1683. He married Joanna Way in 1680, and she died in an epidemic in 1689. He was an extensive landholder, and a merchant in Hartford, Connecticut. He died September 4, 1727, reportedly at the age of 70, which would make his birth date 1657. His will is in the Connecticut State Historical Museum at Hartford, Connecticut. Samuel’s son Isaac was born in New London, Connecticut, about 1683. He married Mary Jones of Colchester, Connecticut, daughter of Thomas and Catherine Gamble (or Gammon) Jones on February 28, 1705. They settled in Colchester, which is now called Salem. Isaac died in 1727. Daniel, tenth and youngest child of Isaac and Mary Jones Fox, was born in 1722 in New London, Connecticut. As a boy he went to East Haddam, Connecticut, where he was apprenticed to Lt. James Cone to learn tanning and shoemaking. On October 10, 1747, he married (1) Hannah Burr, daughter of Jonathan and Abigail Hubbard Burr of East Haddam. He bought 200 acres of land near Millington, Connecticut, on March 20, 1752. Hannah joined the Congregational Church by letter. She died August 17, 1760, in Millington or East Haddam. Daniel joined the Congregational Church of East Haddam on March 10, 1766. On March 29, 1775, he sold 30 acres of land for $15.00 to Nathaniel Tiffany. He married (2) Elizabeth Gates, and after her death, Sally Crittenden kept house for him for several years. On January 26, 1779, he sold his house and land to Isaiah Rogers and moved to Canaan, Columbia County, New York. He bought 170 acres of land and built a strong, two-story house of logs, the only two-story house in the community. Four of his sons served in the American Revolution…but that’s a story for another day! This entry was posted by Mary, The Primary Source Librarian on Sunday, July 27th, 2014 at 12:06 pm	and is filed under Miscellaneous, Primary Source Lessons. You can follow any responses to this entry through the RSS 2.0 feed. You can leave a response, or trackback from your own site.